Snow White and the Seven Dwarfs is my all time favourite Feature animation movie. The movie was released in 1937 and is an all time classic. Snow White still holds up very well. It was the first animated feature and it is remarkable that the Walt Disney Studios could produce such a film only 9 years after the debut of Mickey Mouse. 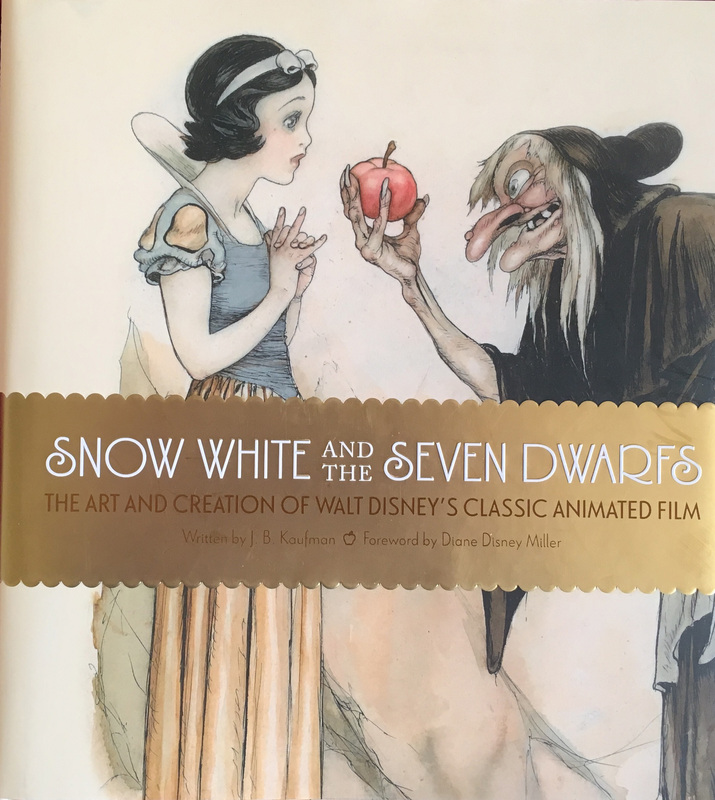 Numerous of books have been published about Snow White, but this book: Snow White and the Seven Dwarfs: The Art and Creation of Walt Disney’s Classic Animated Film is a true beauty. It actually is a catalog for an exhibition of the Walt Disney Family Museum in San Fransisco. The book begins with a forward by Diane Disney Miller, the daughter of Walt Disney. She is also one of the founders of the museum. The book is written by B. Kaufman who has written several books about animation. The design of the book is in the style of Snow White. The text is placed on old book pages, like you are opening the book like the opening sequence of the movie. The design of the book is meticulous. Each chapter has a symbol that reflects the scene of the chapter. In the corner of the book, you can find a little thumbnail of the symbol. The book follows the story of the movie. It begins with a short introduction about how Walt Disney decided to make the first animated feature. The first idea began in 1933. Walt Disney was becoming a household name and apart from the Mickey Mouse cartoons he also made The Silly Symphonies that showed fairytales and other short stories. Who’s afraid of the big Bad Wolf and the Three Little Pigs where a smashing hit. Walt Disney thought he could make Snow White within a year, but the project became more ambitious. He wanted the best artists to work on the movie. Within the 3 years of production the studio was expanded by 600 artists. Because it still was a depression Disney could get the best artists. In this book you see a lot of drawings, layouts and paintings that never ended up in the final movie. They are all preliminary and inspirational sketches. Great artists like, Albert Hurter, Ferdinand Horwarth and Gustav Tenggren worked on the initial designs. They were all European artists. Because Walt Disney was looking for a more European look for Snow White. It was the first time that the artists needed to animate human figures and make them believable. The design for Snow White was made by the same artist that also designed Betty Boop. Grim Natwick. For the animation of Snow White, the dwarfs, the Queen, the Huntsman and the Prince they filmed real actors. The footage was used as reference, ti make the characters more believable. This book is 256 pages with lots of great artwork that I have never seen before. It is a welcome addition to my Disney book collection. The book is still available on Amazon. Click on the links down below to go to your Amazon Store.